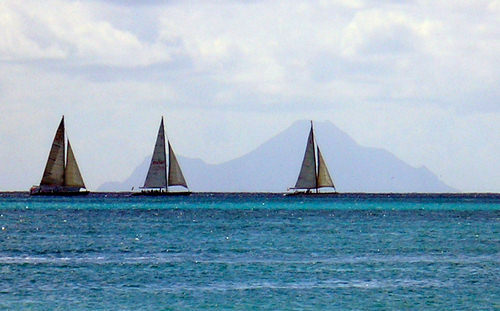 The Americas Cup competition holds a unique spot in the history of sailing. It embodies a century and a half of tradition, uncompromising excellence, and personal dedication. Although the 20th century was pockmarked by global disater and warfare, I think many would agree the AC challenge stood as a distant beacon, an iconic bright star that held the common hopes of so many sailors trying to express their common beliefs in this fragile, watery world. I know, I know the movie got the sailing all wrong and it should make any real sailor cringe, but wow, Coppola got the spirit right. Not surprisingly, that tradition found its way into Second Life. Please, give Florencia007 Csak a standing ovation! 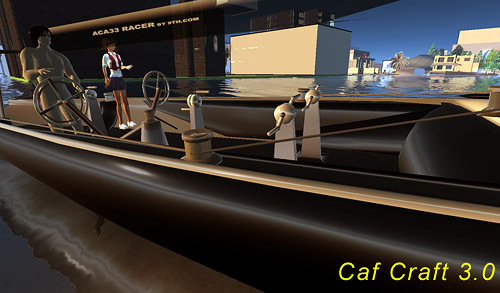 In Spring 2007, Florencia and 9TH.com helped organize and sponsor the ACA-SL America’s Cup Regatta in Second Life. 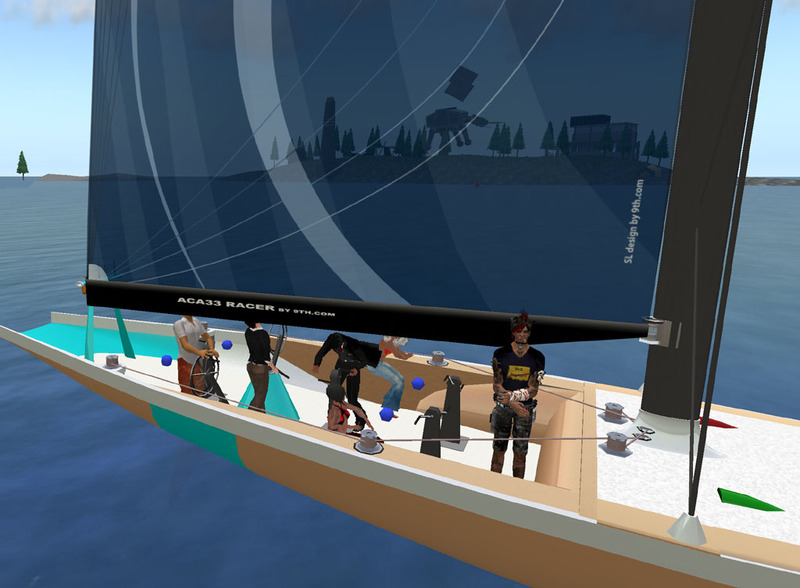 It was a truly wonderful event that became a defining moment for all SL Sailing, clearly demonstrating the metaverse potential — and opportunity — for a RL-SL sailing emulation. 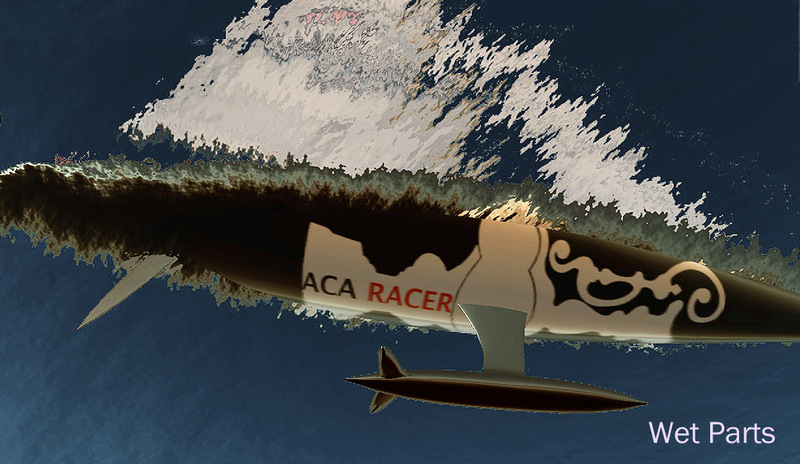 The ACA32 Racer was the competition boat originally designed for the Americas Cup Anywhere- SL event. It was a combined, creative effort that involved several builders and scripters. Jacqueline Trudeau provided the ACA32’s sail engine, and the boat’s visible hull and hardware were part of a wearable attachment (remember, this was way before sculpties!). The boat was majestic and impressive, and immediately won the hearts of a generation of SL sailors. However, it’s fair to say that as boat design evolved in Second Life, the ACA Racer failed to keep pace. This was a tad ironic, since in Real Life the AC boats are often considered on the cutting edge of nautical design, continuously pushing the limits of technology and construction. Two years ago I wrote a short article humorously complaining about this, asking for an ACA fix and whining “ I want a new gun.” Since Christmas was approaching, I included a letter to Santa Claus, asking for a new ACA, something to push the envelope. I got pretty specific, too: I wanted a boat with Apparent Wind, Realistic Shadowing, and omg… a Spinnaker! Well, it turned out that upgrading the ACA was no easy matter. Over time, several scripters had tinkered with it, and any major upgrade was going to take somebody smart who had a clear vision, a large commitment and a fresh approach. The new 3.0 has all the things I begged Santa for, and much, much more! I’ll try to focus my initial, brief discussion here on some background and issues not covered by Q; I’ll have a lot more to say later! 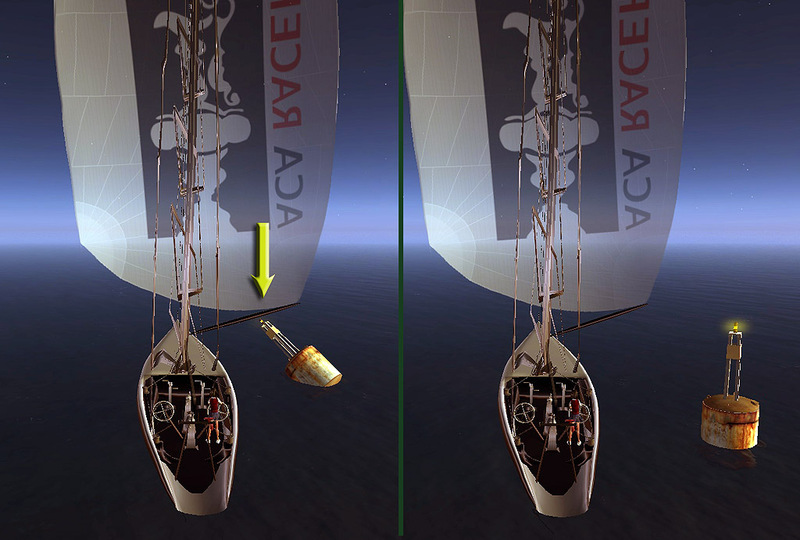 Most sailing vessels in SL are “derivative.” In other words, they are based on a prior sailing algorithm, such as Kanker Greenacre’s public Tako scripts. I mentioned above that the original ACA32 sail engine was scripted by Trudeau, and I admit with a degree of chagrin that I’ve always thought of the ACA32 (and early versions of ACA33) as sort of a ‘buggy prototype’ for the Trudeau Larinda that launched several months later. Well, Caf Binder didn’t go that route; he went back to square one and redid everything in the ACA, incorporating some of the best ideas from Trudeau, Mothgirl’s Fizz engine, and Caf’s own Jangars. The result is a new sail engine; if you ask Caf what the 3.0 is based on, he grins and quickly answers “The real ACC v 5.0.” Caf’s vision is to build a boat that uncompromisingly reflects the Real Life sailing properties of recent Americas Cup monohulls. Quirky’s video above mentions a few simple examples of this penchant for reality, including such items as when you raise/ lower the spinnaker, there’s a ten second delay, and the jib can’t trim tighter than 10°. I have lots to say about this boat, and a lot I still haven’t yet figured out; today I’d just like to give you some basic performance plots I’m working on, and say some nice things about Neron’s spinnaker! Since Caf’s design target was to realistically model an IACC Class boat, let’s begin by talking about those real performance characteristics. 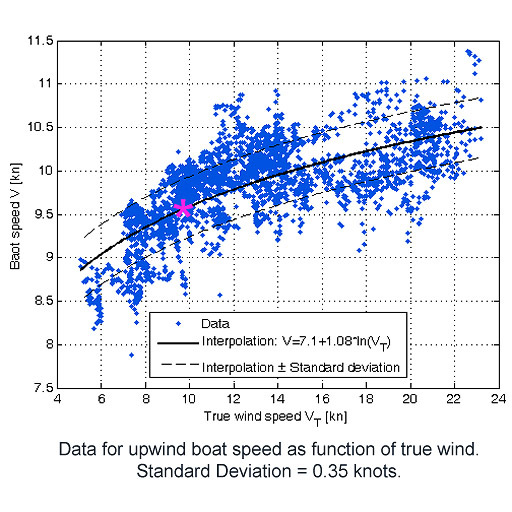 The plot below shows data for upwind Boat Speed (BS) as a function of True Wind Speed (RWS). The numbers are for the Swedish Victory Challenge Team’s IACC racer “Orn” and adapted from figures published in Joel Nielsen’s Master’s Thesis. If you look closely at the above best-fit curve, you can see that under low wind conditions, Orn’s boat speed can exceed RWS; with a 6 kt breeze, the boat will do 9 kts! However, as wind intensity picks up, multiple factors resisting the boat’s forward motion become more prominent, and the boat is less responsive. In a 20kn breeze, Orn does around 10.4kn. My whole point here is just to say that a RL sailing vessel has a nonlinear response to increasing wind speed. Caf Binder’s evidently modeled that into the new ACA33 3.0. I don’t know where Caf’s getting his numbers, but I’m impressed the boat I’m sailing comes close to the actual RL performance values for IACC. Take a look at the chart above. At low wind speeds the 3.0 matches or exceeds RWS. However, around RWS =10kn the boat becomes less responsive and at RWS= 20kn the boat speed is approximately half RWS. A pretty close match to the RL numbers! Here’s my initial ‘polar’ for the ACA33 3.0 with RWS= 9.7kn, flying just the Main and Jib (no Spin). 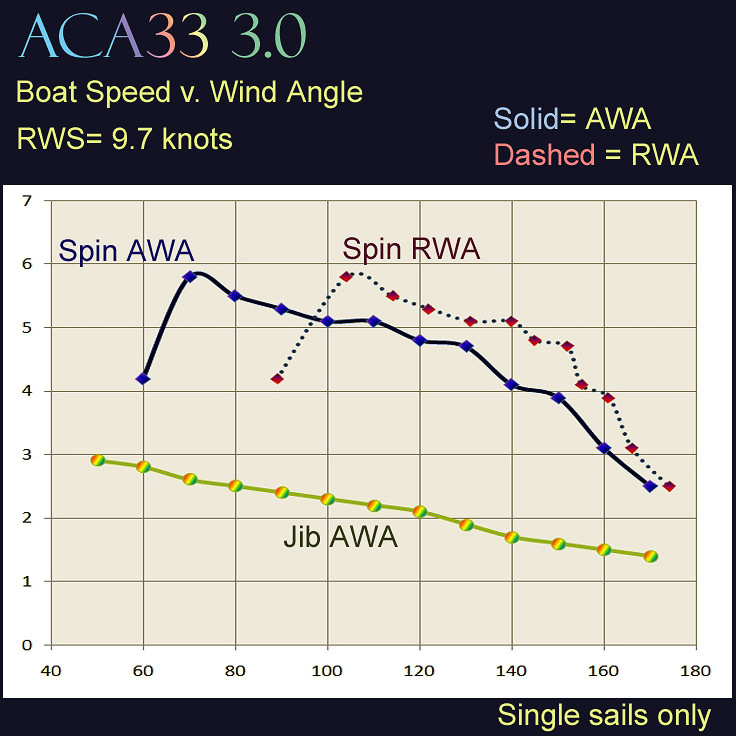 The 3.0 uses a “full-dose” Apparent Wind calculation, so there’s a big shift in Apparent Wind heading towards the bow as the boat accelerates. In a 9.7kn breeze, an Apparent Wind Angle of 60° actually corresponds to a Real Angle of nearly 120° ! The HUD in 3.0 has a nice feature that alternates the AWA and RWA displays, so it’s actually pretty easy to keep track of this stuff. I mentioned the above numbers correspond fairly closely to the RL IACC racer. However, it’s also fun to note that 3.0’s performance matches the the published polars for the Virtual Skipper VSK5 ACC boat. 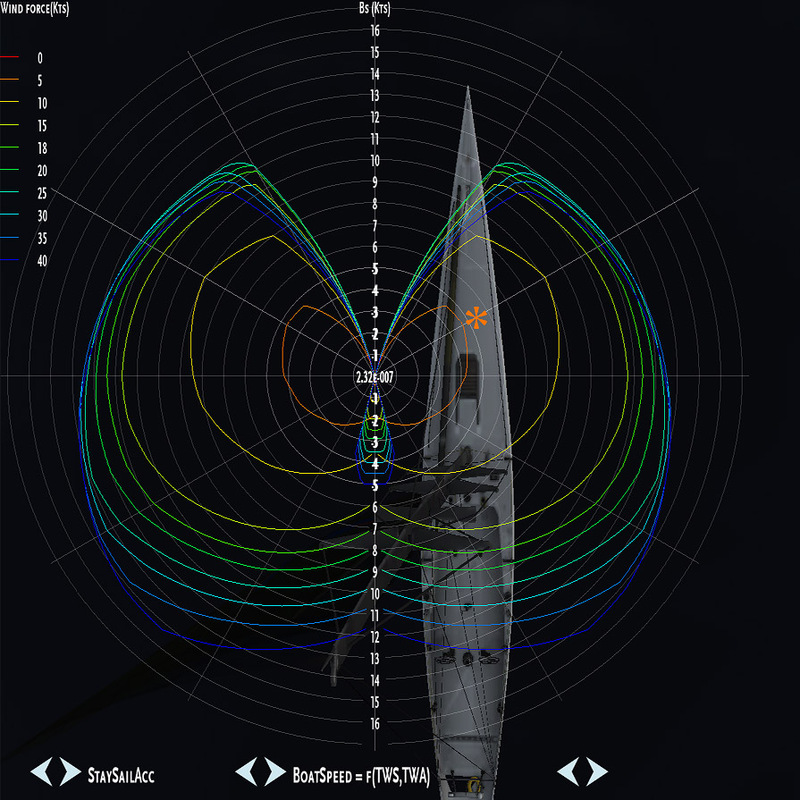 If you click on the image to the right, you’ll get an enlarged view that shows a response curve for RWS=10kn that’s pretty similar to the above results for 3.0. I’s nice to see how closely all the versions match up! Neron’s spinnaker and hull pass that silly test very nicely! As you can see below, the front and sides of the ‘chute’ bump into a test object with nearly perfect contact. There’s a small ‘gap’ near the top of the spinnaker when it is the first touch point, but that’s really irrelevant for sailing or racing, even under truly extreme circumstances. It’s actually not a trivial issue, since the spinnaker on 3.0 automatically rotates in response to the wind heading. (I’ll tell you more about that next time). Today I just want to add the plots for the spinnaker and jib to emphasize the differences, and to give you some data so you can decide when you want to switch head sails. 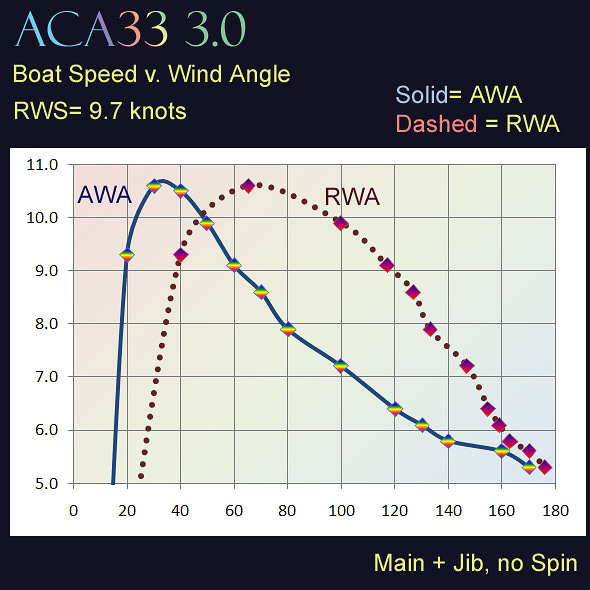 The curves below show Boat Speed v Wind Angle for Spinnaker and Jib used alone, with the Main down. The spinnaker provides a big boost for AWA headings over 60°; it’s easily twice as effective as the Jib from AWA= 70° – 160°. I have a lot more to tell you about this boat… and I’m still figuring a lot of it out. I’ll fill you in next time! And Thank you 9TH, Caf, Quirky, Neron and Flor. I Got a New GUN !! 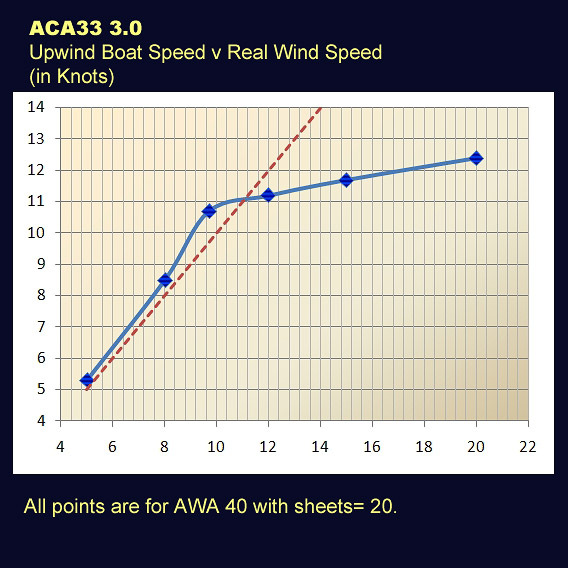 This entry was posted in ACA, ACA 3.0, ACA33 3.0, Racing, Sailboats, Wind Vehicle Algorithms. Bookmark the permalink. In relation to the current DMCA claim being filed in world I think it’s time to add it wouldn’t be America’s Cup without a legal battle. Loved the review of this boat. Yo’ done good! Thank you Fearless for all your humor, skill, and determination. I think many others would agree… a race without Fearless… is a lot less fun! See you on the startline! Thank you for that detail, Caf! I kept trying to pinpoint that angle, and never came up with an exact number; now I know why! Im very impressed at the time and testing Jane put in on this . As soon as she finally recieved a Beta to test she went to work . Jane was intrumental in the correction of the wind polars. That we corrected days before launch .We can look to articles like this as a future reference of how real hands on reserch And testing benifited all . Bravo Jane . Bravo Caf and whole Beta team that helped. I gave that data to Caf and he fixed the glitch in a few minutes. However, with Caf’s boat I actually had to work hard to find even find one, single thing to legitimately complain about. In such a complicated build, finding ‘one bug in beta‘ this past week seems pretty trivial. I’m sure there are more bugs hiding in that boat someplace; that’s part of any boat release process. Can’t ever complain about that! Again: ACC5 RL has that, especially with thin, light, spinnaker sails, right? I just wont spell any long words! Pingback: The Latest Review is in!!! 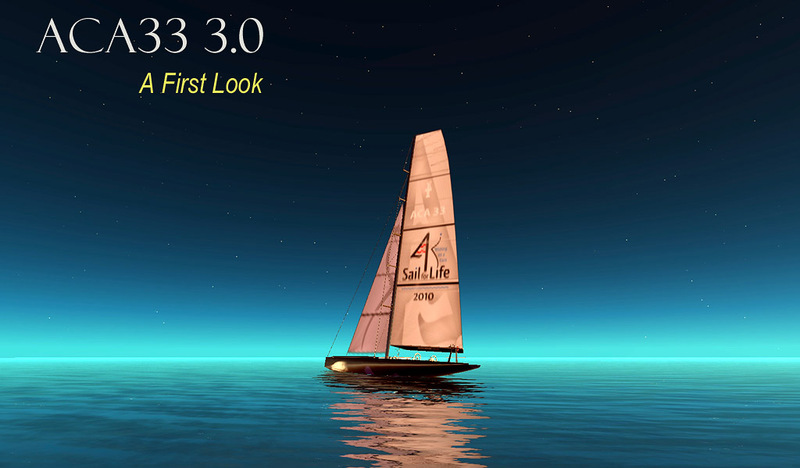 just out of curiosity, is there any phrf data on the 3.0? Hi Lance! Good Question. I’ll take a look at the numbers, see if they make sense yet. When I first looked, people were getting familiar with the boat. You know me… I can’t stay quiet long 🙂 ! !